On Friday the 13th we were honored to receive two awards from the Home Builder’s Association of Greater Chicago. I am proud to say a Gold Key was for my residence, the design of which everyone on my staff played a role. Each space required deep thought and many drawings – the kitchen with its leather wrapped wall of cabinetry; the guest bedroom with its Mondrian-like murphy bed; the guest bath’s wall of glass; the master bedroom’s upholstered walls; and the terrace – the space where most of our entertaining takes place. 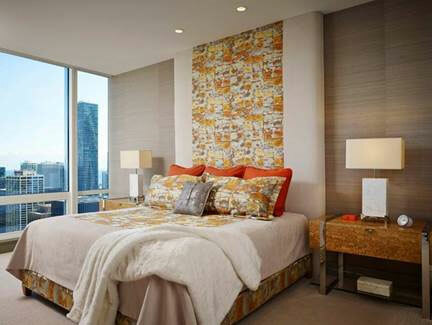 Having completed 23 residences at Trump Tower – we have an intimate knowledge of the iconic building and how it works – qualities that keep new residents bringing us back. In fact, the second award we received was a coveted Crystal Key for the in-town Trump residence of one of our North Shore clients. This achievement aligns us with other professionals dedicated to excellence in interior design, construction and innovation. It is our third award for spaces we have created at this address. 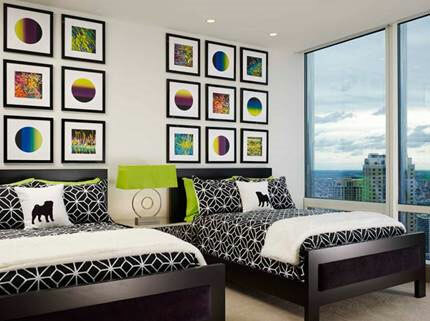 Our clients envisioned their sleek city digs as a complete departure from their classically traditional suburban home. The result? A 4,000 square foot condominium with a den and home theater/office space coupled with an adjacent studio unit that provided a needed third bedroom. Our task was to create a plan making the combination appear authentic, as if it were original to the tower – an achievement that would win the approval of the building’s board of directors and allow us to proceed. 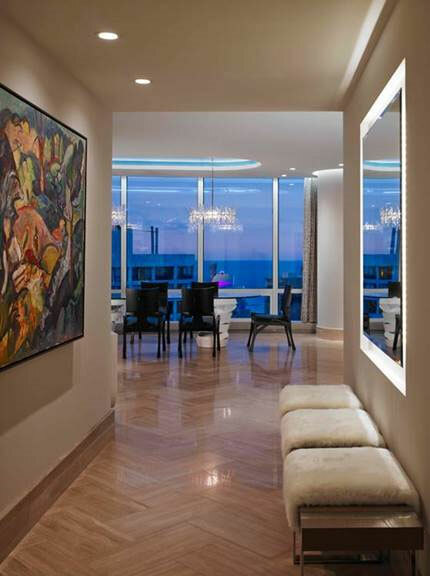 Our design concept combined color, sculpture, and dramatic lighting throughout the residence. 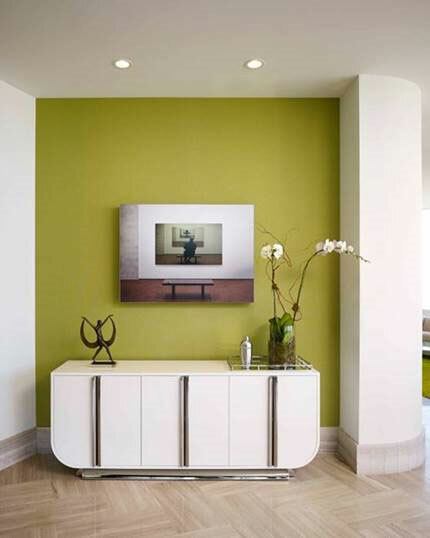 On a wall between the entry and dining room a Brueton dining buffet offers an effective statement against a dramatically colorful wall. The artwork is a provocative photo narrative by artist Gregory Scott, recognized for his bold combination of self-images in photography, painting, and video. Mechanical hardware for the motorized sheer draperies is concealed by the dropped ceiling. We created a pocket to hide the track and motors in keeping with the contemporary architectural style. A more gracious effect was achieved by removing a wall between the dining area, den, and kitchen– an effective strategy we’ve used in multiple other Trump homes– always for the same reason. Without a wall built right down the middle the room’s columns appear more sculptural. 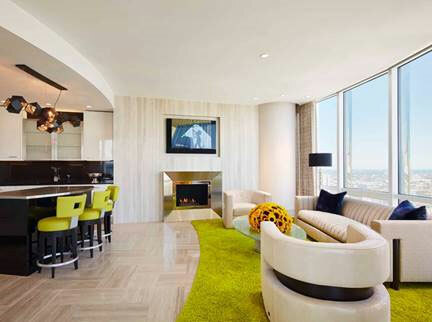 The home’s common areas are anchored by chevron patterned travertine flooring. The fireplace walls are clad in slabs of the same stone. The saturated color of the wool carpet defines the seating area. LED lighting embedded in both the columns and draperies creates a glow throughout the living room, dining area, and den. The Trump standard kitchen had never been used, but our clients wanted something more original. We created a new kitchen design concept to compliment the rest of the interior space. 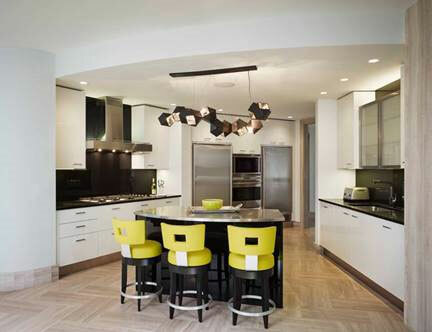 The sculptural fixture above the island provides great lighting. The gracious master bedroom suite features two walk-in closets, his and her baths, and extraordinary views of the Chicago River and skyline. A crisp color palette dominates the third bedroom – originally the neighboring studio. The custom-made lampshade manufactured after we found the ready-to-wear bedding repeats the color scheme used throughout the home. Because the studio’s original closet doors swung into the room, they conflicted with a pair of queen-size beds. We designed custom doors using a textured stainless steel center panel and barn door-type hardware which allowed access to the closet interior. Once again, this has been another extraordinary year. We must thank all of our clients who believed in John Robert Wiltgen Design and allowed us to transform their homes into works of art. In addition, we extend our heartfelt thanks to those of you who referred us to new clients. You, too, believe in the JRWD team. Well done, both the design/execution and the report..
You are simply amazing. 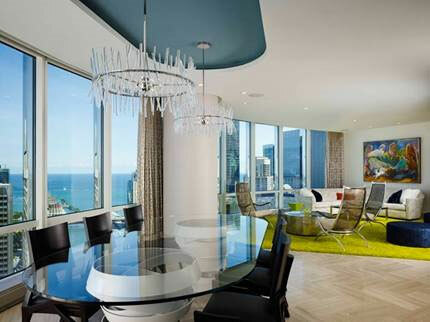 This condo is stunning! Congratulations John! I particularly loved the Murphy Bed -never had Murphy and Mondrian used in the same sentence – hah!!! WOW! So stunning … Congrats! Kind regards, Nancy G.
Wow and congratulations! So happy for you! We stayed downtown last night and it was great to receive this email looking out at the skyline and lake! Congratulations, again, to you and your team! Wonderful work! Congratulations. You know I’m a fan. Congratulations! Your designs are exquisite and warm! Beautiful, John. You are amazing! Congratulations!! I loved reading this email and I absolutely LOVE this unit! I noticed the family room sofa, mirror in hallway, and bar stool chairs…! It all looks great. Fantastic news about your own residence as well. Congratulations!! So proud of you. Love the modern finish. Just think you might be designing the white house in a year ! I especially love the bedroom doors, and the fire place room. Beautiful. Thank you for sharing , and congratulations on your awards. It was a joy hearing from you once again and sharing your beautiful pictures, that I always enjoy viewing. You are truly a master of furniture and decoy designs. If I just had 1% of your talent, I would be a millionaire, lol. Take care, and keep the pictures coming. Enjoy your holidays. Awesome work John. I hope all is well with you. Thanks for sharing and I will also share this great work with friends. This is truly a spectacular install! Such attention to detail and spectacular design….love it John and team! Absolutely stunning and well deserved. Congrats! You are a true artist, and the best designer around! I love what your team did with the kitchen and den area, especially the shape and use of space, and the kitchen fixture choice is really fun without seeming to whimsical for the style. Beautiful work. Glad to see you are receiving such great press and awards. You’ve been doing this type of wonderful work for many, many years. All the best for continued success. Trump is looking sweeeeeet! Honestly John really amazing. Thank you very much for your e-mail and Congratulations on Gold Key Award! Absolutely stunning design! Thank you so much for sharing the news and your home pictures with me. Congratulations on your recent awards; both units look outstanding. Beautiful and ingenious installation as always. Thank you for choosing the Brueton Athens buffet-it looks wonderful. If you have an image that you would share with us, we would appreciate it. Happy Thanksgiving to you and your very talented staff!